Careful protection, improvement and wide popularization of unique cultural heritage of Turkmen nation is among the priorities of the state strategy. Owing to special attention of the Head of Turkmenistan, national equestrian branch has entered new level, the country takes exceptional measures for development of its infrastructure, increment of the livestock of thoroughbred ahalteke horses, activation of international cooperation in this field and popularization of equestrian sports and national horse riding traditions. Ahalteke Equestrian Complex, which is located in the Kopetdag foothills, has excellent conditions for the best horses. This equestrian centre is the evidence of the awe and touching love of Turkmen nation to this wonderful animals. The complex makes big work for protection of breed purity of ahalteke horses, improvement of their exterior and increment of elite livestock. The Head of the State paid the visit to one of his favourite horse Ruhubelent, which immediately recognized his master, pinned the ears and went toward the President with the head up. This excellent racer was born in the complex in the beginning of 2017, which was the year of health and inspiration. 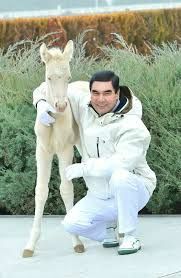 The President of Turkmenistan named the foal Ruhubelent, which means Inspired. The foal is two years old now; it grew up and is surrounded by love and care. Feeling sincere attitude and skilful hands, Ruhubelent followed to any hand move of the Head of the State even responding to the intonation of the voice as well as felt free and trustfully. In such moments you realize that internal connection that has been formed up between the horse and human for many centuries, which these days, became the base for new level of development of national horse breeding and equestrian sport. As is known, a pedigree of Ruhubelent goes to the famous bloodline of Peren. Its ancestors were famous horses. Beautiful and fast sorrel ahalteke horse Polatly is one of them. It is the winner of numerous champion titles and prizes in different countries competing against outstanding horses. It set the record, which remained unbeaten by other horses for around three decades. Ahalteke horse has combined all the best that is available in modern world – strength, activity, inspiration, energy of creativity. Turkmen poets have been dedicated the poems to horse through all times and people have brought the catchphrases about its friend and associate until our day. In present time, ahalteke horse is our pride and glory, the heritage of humankind. Dealing with Ruhubelent, the Head of the State pointed by gesture the horse to march and it performed the order as if it understand human speech. What does it speak about? It speaks of close unbreakable tie between the human being and horse. It is not occasionally that we refer to this horses as paradise horse. There are so many wisdom, so many love when they look at their master! National horse breeding traditions, which came to us from the past centuries, are alive and continue developing in our country. But today, they received new developed, having been enriched with modern knowledge. After, the President of Turkmenistan made a ride on Miras. It is not a secret that originality of ahalteke horse, its special character require not just high qualification of the rider but the ability to understand and feel the horse. The Head of the State demonstrates outstanding riding skills and Miras starts moving with pleasure in gracious pace. Unhurriedly riding the horse, President Gurbanguly Berdimuhamedov looked around local natural attractions and enjoyed its beauty. It is worth mentioning that horse breeding is made not only in harmony with nature. Turkmens have been improving ahalteke horses by centuries combining centuries-old art of selection with natural features of the horses. Bright golden colour, long legs and elegant neck, flexible body and lightness of flying bird, inexhaustible loyalty and boldness – all these features are inherent to ahalteke horse, the locus of natural features of the horses and result of creative work of national selectionists and high qualified modern horse breeding specialists. Ahalteke horse became beautiful image, an embodying ideal pathos of new age – time of inspiration, spiritual rise and creativity. Its fast run symbolize the dynamics of our state confidently moving forward. It means that the year under slogan “Turkmenistan – Home of Prosperity” will be the year of new great starts and new grandiose success and achievements.